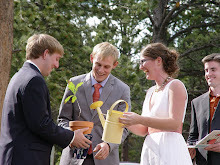 Matt and I trekked to our ceremony and reception sites for one last logistical visit. It reminded me that we are so, so lucky for picking great sites. It's funny that picking a location is one of the most important decisions a couple has to make, but it's also the decision they have to make early on in the wedding process, before they have done much thinking about the whole thing. 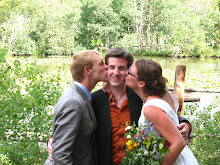 Both the ceremony and reception sites are casual and outdoors: The more casual the wedding, the less stressful it feels. Plus, having a casual, outdoor wedding means that I can get away with wearing a much less expensive dress (and the guests will probably be more comfortable in their more casual clothes). Both the ceremony and reception sites are not typically places that host weddings: This means that the owners are very enthusiastic about working with us and are willing to accommodate us in ways that might not be possible if they had to do it routinely. 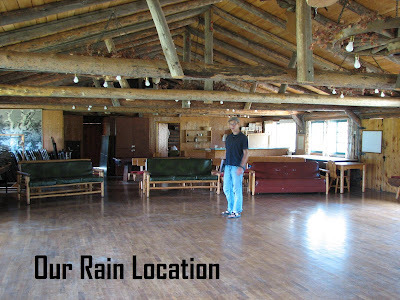 For example, the owner of the ceremony site went ahead and reserved the recreation building (see picture) for us free of charge just in case it rains. The owners of the reception site are letting us use their coolers, grills, white lights, drink dispensers, iron and ironing board, serving platters, bowls, crock-pot--and the list goes on! Both the ceremony and reception sites are free: Since some of our guests are staying at the ceremony site, the owner let us use a corner of her property (i.e., picnic tables next to a lake) for free. Like I mentioned above, she's also reserving the recreation hall for us for free, just in case of rain. At the ceremony site, we are renting out all the rooms, so we are free to use the main house and the entire property for our reception (which includes a living room, kitchen, patio, deck, porch, tables in a grove of trees, hot-tub, little trail, fire pit, volleyball court, horseshoes, and a hammock). 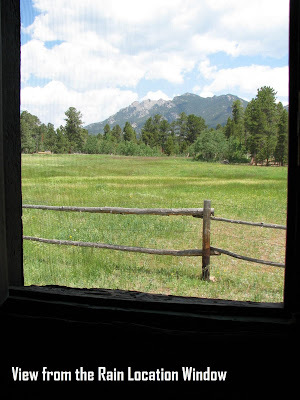 Our guests are only paying $25-$35 per night to stay in the lodge or in cabins. I'm feeling really good about the whole thing, primarily because of the relationships we've built along the way. We took Cathy and Cory (the owners of the reception site) out to lunch today and talked through all the details. They are doing so much to help us, and yet they also feel like guests. 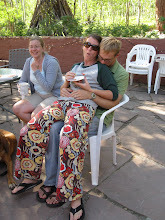 Repeatedly, we told them they must eat the food and hang out with everyone. We also made a wise choice by getting married close to our home. We've been able to make several trips to the two sites to figure out all the logistics. What a help! OK so I know I'm obnoxious (just like my mom) but I have to ask... how did the picnic table thing work out? We found a BEAUTIFUL site that is a riparian preserve and the owner said we can host the wedding there for $20 first hour, $10 thereafter. Awesome right!? The only problem is that they have picnic tables... and my mom HATES that idea. I figured I could just buy some long fabric (clearance!?!) and cover up the wood? We also would need a few more tables (since I have a huge family...) so I don't know how this would work. I love love love your site. 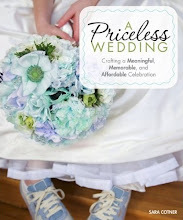 I am literally reading it from the ending to the beginning (so that I can start where you started.. if that makes sense...) because fiance and I love your opinion of weddings and the price tag rocks! So picnic tables, how would that work?? Do you have any pics? ?